"If you're like me, you don't want to live your life with a 'barely-get-by' mentality. You want to crack the ordinary mold and become the best you can be. You want to break the power of the past and the chains of limitations and feelings of inadequacy. You want to learn how to live your best life now and discover the joy, peace, and enthusiasm that God has for you. In this book, you will discover just how to do that! Allow the Scriptures to speak to you. Be still and listen to what God is saying through His words. Explore what it means to enlarge your vision. Learn what God has to say about you and allow Him to rebuild your self-image. Understand the power of your thoughts and words, and begin to let go of the past. Renew your strength despite whatever adversity you face. Learn to live as a person who gives generously without reservations, and choose to be happy." - Publisher A beautifully illustrated collection of some of the most inspiring messages from #1 New York Times bestselling author Joel Osteen's Your Best Life Now. Since the publication of Your Best Life Now, millions of people have been discovering what it means to live happy, successful, fulfilled lives. In his book, Joel Osteen reassured us that living life to our fullest potential is within our reach. His seven step plan taught us how to make the most of our lives by realizing how a healthy self-image and a vision for the future are just some of the keys to unlocking our potential. Now Joel offers a book of Scriptures and meditations based on his seven steps that allow readers to truly focus on the primary themes of Your Best Life Now. 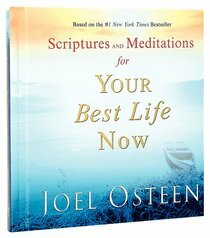 About "Scriptures & Meditations For Your Best Life Now"
A beautifully illustrated collection of some of the most inspiring messages from #1 New York Times bestselling author Joel Osteen's Your Best Life Now. Since the publication of Your Best Life Now, millions of people have been discovering what it means to live happy, successful, fulfilled lives. In his book, Joel Osteen reassured us that living life to our fullest potential is within our reach. His seven step plan taught us how to make the most of our lives by realizing how a healthy self-image and a vision for the future are just some of the keys to unlocking our potential. Now Joel offers a book of Scriptures and meditations based on his seven steps that allow readers to truly focus on the primary themes of Your Best Life Now.